Lift your boat out of the water and launch it again from our boat hoists and pier decking. 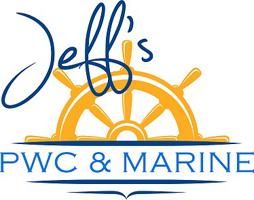 At Jeff's PWC & MARINE, we want to provide you with everything your boat needs, and that includes a safe place to dock. Contact us for more information about our selection of hoists and piers. Be sure to ask about pier installation and removal as well. Give your boat or watercraft a suitable shelter with our boat hoist and pier decking. Check out our high-end, durable product lines from brands like ShoreStation and LakeMaster. Weekends by the water should be spent having fun with your family, not repairing your pier and hoist. That is why Byron Godbersen, the designer of the first ShoreStation pier in 1959, made sure to use heavy materials, stronger winches, and higher-quality cables. This delivers the dependability you need to enjoy your time on the water. Dori Pole is a unique outdoor display system. 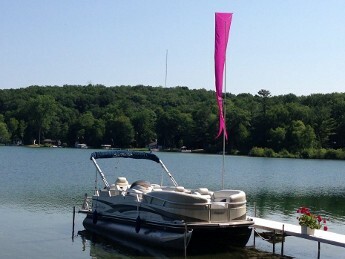 These long, colorful pennant flags float beautifully in the wind and have been proven to help deter nuisance birds such as geese, seagulls, and pelicans. Our fiberglass poles are lightweight, flexible, and can reach up to 22 feet in height. Walk out over the water on one of our LakeMaster piers. Made from the same durable material as popular PVC fencing, our lightweight pier decking has a smooth surface that is slip-resistant. It stays cool in the sun, will not rot or splinter, and has low maintenance costs since you don't have to paint it. Plus, it carries a 20-year limited warranty for your peace of mind. Three colors are available: gray, tan, and white. Tired of cranking your hoist? Ready for a 12V battery powered direct drive hoist motor? 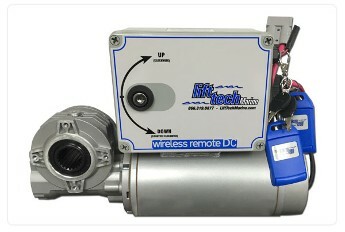 Lift Tech motor is your answer. Replaces your hoist wheel and operates your hoist from a key fob. Takes the work out of hoisting your boat up and down. The family will love it. No more cranking!! It uses a watertight solar generator during daylight hours to charge 4, 1.2V rechargeable batteries that power 5 super bright LED’s (Light Emitting Diodes). The 5 LED’s have a life span of 100,000 hours. The unique bell shape design keeps the buoy vertical in the water. 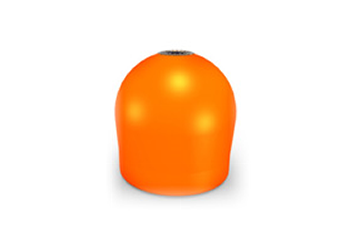 It is rotationally molded with durable High Density Polyethylene. The photocell in the solar panel automatically turns the lights on when the sun sets and turns the lights off when the sun rises. The Aqua Lantern promotes safe boating at night and reduces the chance of damage to personal property. 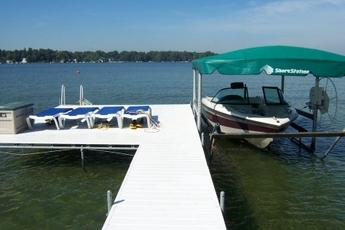 Protect your floating swim platform, floating trampoline, pier, dock, PWC and swim areas.